Do bilingual children learn at a slower pace than their monolingual peers? Studies have shown that bilingual children have even better cognitive brain function than their monolingual peers. Studies also show that children who speak multiple languages showed exceptional abilities with multitasking and problem solving on a whole compared to their monolingual peers. Is it harder for an adult to learn a second language? It is a long standing myth that it is hard for an adult to learn a second or even a third language. This myth that somehow when one becomes an adult he or she is just incapable of grasping a new language cannot be farther from the truth. What is true is that children learn languages more organically because they learn a foreign language while their mastery of their native language develops. Adults on the other hand already have a fully developed language skill and will have to learn a language systematically rather than organically like that of a child. Am I too old at 70 years to learn a second language? Studies are showing that due to the brain activity of those that spoke or were learning a second language that there correlation with the higher the levels of fluency in a second language the longer Alzheimers’s disease was in some cases significantly delayed. As a monolingual parent how can I support the language at home? The majority of the world is bilingual yet according to statistics only 17 percent of Americans speak a second language. Supporting language education is such and investment as you will be giving your children he edge. Enroll your child in a program and that will grow his or her language skills in that target language and practice! Look for opportunities all around you to give them opportunities to use their language. If your local does not lend itself to that use the worldwide web as it prevents us from being limited by geography. What languages are offered in the program? 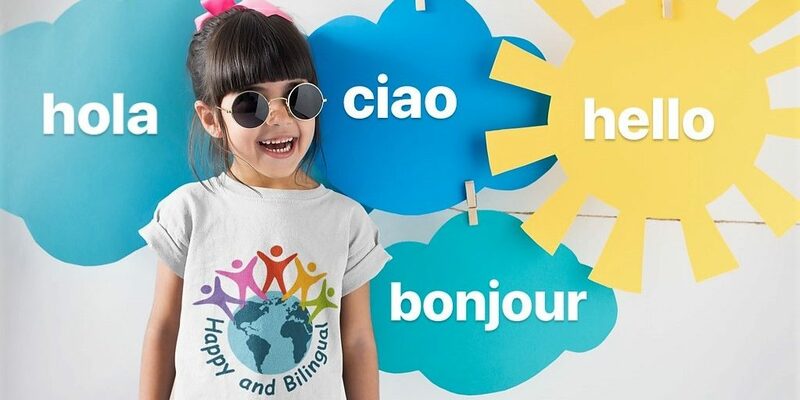 Happy and Bilingual School’s Year-Round Program offers Spanish, French, Italian and ESL(English as a Second Language). The Summer Program offers Spanish and French lessons ONLY. What is the difference between Happy and Bilingual School’s Summer and Year-Round Program? The Summer Program offers a more accelerated version of the Year-Round Program and is attainable because the summer break offers more free time. In each four-week session of the Summer Program students have approximately 14 hours of learning as opposed to 4 hours of study per month in the Year-Round Program. The Summer Program offers both group and private classes, while the Year-Round Program has private sessions ONLY (siblings of similar ages may study together in private sessions both in the summer and year-round program). Are there programs for both adults and children? Yes, the year-round program is for both adults and children, while the summer program is for ages 6 to 15 years. In the year round program students can be as young as 3 years and will have to learn with a parent or guardian. For adults there is no limit to how old you have to be to enter the program. What time are classes during the year-round program? The year-round program only offers private one on one classes and students in a private lesson can determine their class times based on availability. What are the dates for the Summer Program? The 2019 Summer Program has two sessions – Session 1 (June 10 – July 3) and Session 2 (July 8 – August 1). Students may choose to enroll in one or both sessions during the summer. On what days are classes held during the summer program? Classes are held on Monday to Thursdays each week! What times are classes offered in the Summer and Year-Round Program? If student enrolls in both session 1 and session 2, the student can select the same or a different class time for the group session. All classes are held ONLINE ONLY in our virtual classrooms. The sessions are live with a native speaker in our award-winning teaching platform. The classrooms have blackboard capability for students and teacher alike. They can write, draw and share class material as well as view videos and play game. It is very interactive. How do I enter my classes on line and what do I need to access the classroom? Each student is assigned their class link and that class link will be used to enter the virtual classroom from any device – a phone, iPad, laptop or desktop. Student need to ensure they have reliable internet connection for the best results. Are books and notebooks needed for class? All class material is provided for student in the Summer and Year-round Program. Students in the Summer Program will complete a workbook that they will have access to download before classes begin. Student will receive additional class material and assignments, as well as mini quizzes and video links for additional classroom aids and at home practice. Where do my language teachers come from? Our teachers are native speakers from around the world – Europe, Central America, USA, South America to name a few. Will I get reminders about my child’s session? Parents and students will get reminders about their class 2 hours before class start time. What do the teachers do with younger children? The teachers are trained to administer classes to younger children. There is a certain level of attention span and there is a lot more that is required of a teacher to keep them engaged. For children 6 years and under we recommend that a parent or guardian join the session with the student and learn with them. How can I see what my child is doing in a session? All sessions are recorded and are visible to each student for up to 3 days before being permanently deleted. Do your teachers follow a curriculum? Our teachers follow a curriculum provided by Happy and Bilingual School and are trained to teach this curriculum. Will the teachers help my child with their foreign language homework? Teacher can help student with their foreign language homework upon request and may divert temporarily from classroom curriculum to aid wherever needed. The Year-Round Program is not contractual but is a month to month enrollment. Students may leave the program at any time. Tuition in the Year-Round Program is refundable provided classes have not been held. All classes in the Summer Program are non-refundable. Will learning a foreign language undermine my child’s native language abilities? Studies shows that learning a second language increases the students focus and their cognitive skills overall. What age should a child start to learn a foreign language? A child can start learning a second language as early as 3 years in our program provided a parent or guardian is committed to learn with them. Can a student do both year-round program and summer program at the same time? Many students that are currently doing the Year-Round Program enroll into the Summer Program and return to the Year-Round Program after the Summer Program ends. The cost of the Summer Program is $160 for group sessions of up to 4 students and $325 for private sessions. Siblings of similar ages and language level may learn in a private session together in the year-round and summer program. The cost of the Year-Round Program is $100 per month for 8 classes. Contact school for coupons and promotions. What equipment do we need for classes? A desktop computer, a laptop, an iPad or a phone with reliable internet. Students do not need to download anything to enter their classes. A class link will be provided for students to have direct access to their classes. Do I have to understand the language my child is learning? No, parents are not required to understand the language his or her child is learning. The program is designed for students to grow in their use of a second language through the interaction with native speakers from around the world. We welcome any parents that would like to learn the language with their children! If I need to reschedule or cancel a lesson can I? Yes, students in private sessions can cancel and reschedule a class, provided the class is canceled 5 hours before the start that class, or before 8pm CST on the day prior for class that happen before noon the next day. I give Happy and Bilingual School permission to collect and use my data submitted in this form.